The Tambo Foundation and the University of Johannesburg invite you to honour the legacy of Albertina Sisulu. Ma Sisulu was one of the women integral in the planning of the 1956 march to the Union Buildings to fight for the equal treatment of all South Africans. 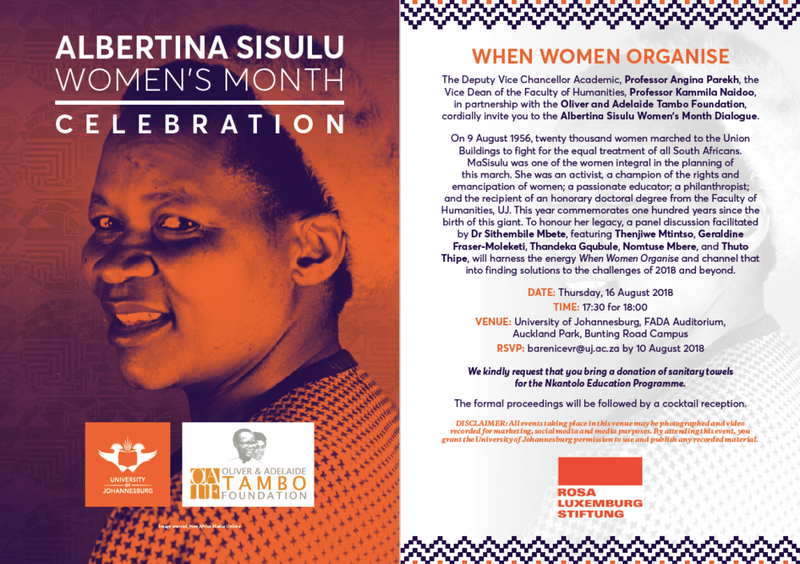 This year commemorates one hundred years since the birth of this giant and the University of Johannesburg, in partnership with the Oliver & Adelaide Tambo Foundation, invite you to the Albertina Sisulu Women's Month Dialogue. In this, the centenary year of Albertina Sisulu’s birth, we at David Philip Publishers are delighted to publish an abridged memoir that celebrates this extraordinary woman’s life. Albertina Sisulu is revered by South Africans as the true mother of the nation. A survivor of the golden age of the African National Congress, her life with her husband Walter, the second most important figure in the ANC, exemplified the underpinning role of women in the struggle against apartheid. In 1944 she was the only woman at the inaugural meeting of the ANC Youth League, with Nelson Mandela, Oliver Tambo, Anton Lembede and her husband in the vanguard. Her final years were spent in an unpretentious house in the former white Johannesburg suburb of Linden. A friend said of her, "she treated everybody alike. But her main concern was the welfare of our women and children." This abridged account of Sisulu’s overflowing life provides a fresh understanding of this iconic figure of South African history. The book is written in an easily understandable language, perfectly suited for young adult readers. Combined with images and illustrations of Sisulu’s life, this new memoir brings the history of one of South Africa’s most notable and important woman to a new generation of readers. This refreshing book is written by Sindiwe Magona, one of South Africa’s most prolific authors, and Elinor Sisulu, writer, activist and daughter-in-law of Albertina. The book is available from all good bookstores across South Africa and online from Loot, Takealot and New Africa Books.